They thought it was over. They were wrong. Back on the hunt for the maniacal figure known as The Raven, private detective Jack Smith must face a nightmare from his past--- but not all is as it seems. A new evil comes to town as he and his dumbstruck partner Alice, a young woman with secrets of her own, get tangled in a web of deception without realizing that the most dangerous truths are the ones they keep from each other. 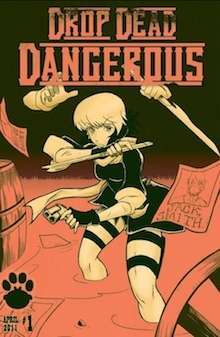 Meanwhile, The Raven paints the town red as the clock starts ticking for a final showdown in this debut issue of DROP DEAD DEAD DANGEROUS, a murder mystery manga by Chad Cabrera and Mike Banting set in the weird, weird west. Who will be left standing… and who will be left in pieces? Also available: Drop Dead Dangerous #0. Read a review of Drop Dead Dangerous #0-1 here!